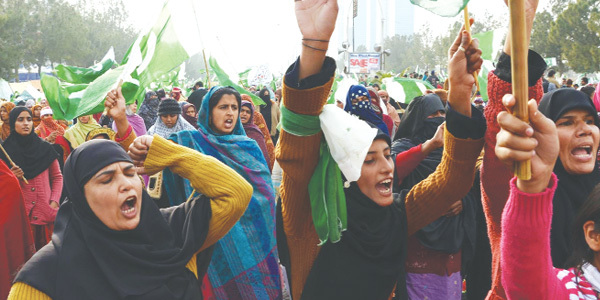 While political pundits, television anchors and columnists were stunned to find thousands of charged workers and followers of Tehreek-e-Minhajul Quran (TMQ) chanting slogans of “change” at the Jinnah Avenue, so were the coalition partners and opposition parties- nott knowing how to get out of the position this mammoth gathering had put them in. Pakistan Today conducted a survey of the participants and women and children, young and old, looked fully aware of their mission and committed to their cause and their leadership, seeking a change. “You media people look surprised on seeing such a huge crowd as you work in isolation from the TMQ. But we are not surprised at all. Today’s gathering is a result of hard work of over 35 years by Dr Qadri. Even during his stay in Canada, Dr Qadri was in touch with us and there was not a single week when we missed a meeting with Dr Qadri. Every week or after ten days, we participated in conferences, seminars through video-link,” said Shahid, a resident of Mansehra who had come to join the long march and sit-in. Asked whether he had come alone, Shahid said he had come through a coach, which was a part of over 100 buses. He said another 100 buses had left for Islamabad while 50 each were coming from Uggi and Shinkiari. Sadia, a participant from Sargodha, said she along with her family members had come a long way, from Sargodha despite the fact that her vehicle had been stopped time and again by Punjab Police. She said she would only return to her home after the agenda of Dr Qadri is accepted. Aslam, a resident of Jatoi, district DG Khan, said he had come despite the fact that he was charged double, paying Rs 1500 to the bus vendor. He said this caravan would not return home till Qadri’s demands materialise. EXPERTS: Noted analyst and MNA of PML-N, Ayaz Amir, while referring to the charged and emotional workers at the sit-in, said the democratic governments had failed to deliver and a vacuum had been created which anyone could fill. “You know, it is a charged crowd who are looking for a change and anyone can win their following. These people are fed up with the poor performance of the governments. They are committed, charged and have come along their families, even small children. No one can force such a charged crowd to abandon their demands,” he said. Asked whether Dr Qadri would be able to get his demands met, Ayaz Amir said the government was fragile but it did not want to give rights to anyone without arm-twisting. “I tell you if they could hold on for a day, pressure would start mounting on the government. And if this crowd could stay here for over 48 hours with the same commitment, then a change would be inevitable and the rulers may be asked to fulfill their demands,” he said. Farrukh Salim, a socio-economic affairs commentator, viewed the demand for electoral reforms by Dr Qadri as justified because the present electoral system had only brought in corrupt, inept and fake-degree holding members of parliament (MPs) over the years. He said electoral reforms must be enacted to allow the middle class and self-made political lot in the parliament and root out corrupt elites from the parliament to make democracy function. On the other hand, the government and opposition parties stand divided and confused having no clue on how Dr Qadri had pulled this shocker. POLITICAL PARTIES: The political parties’ leadership looks confused and stunned over the commitment shown by the TMQ long march participants. While some low-level MPs of major parties are trying to malign Dr Qadri, their leaders are mum and making no comment. Imran Khan-led Pakistan Tehreek-e-Insaf (PTI) has been affected by this long march as hundreds of its workers have joined the long march. Pakistan Today has learnt that there were divisions within the ranks of the PTI and finally the Insaf Students Federation (ISF) leaders informed the party chief that they would join the marchers as they had been following the same agenda Dr Qadri was propagating. Till filing of this report, the PTI’s highest decision-making committee, political strategy committee (PSC), was in session in Lahore to discuss the pros and cons of the long march. As far as the coalition partners are concerned, the Muttahida Qaumi Movement (MQM) leadership is resenting its decision to withdraw from the long march and its workers are unhappy with the decision of their party. A source in the MQM told Pakistan Today that even Rabita Committee was divided over the decision and still some members want the party chief to review its decision. The Pakistan Muslim League-Quaid (MQM) leaders are happy that they had visited Dr Qadri to play a mediator’s role. Chaudhry Shujaat Hussain has made himself relevant as now Dr Qadri and President Asif Zardari need him simultaneously as a linchpin in talks after Interior Minister Rehman Malik failed to take that role by drawing a controversy against Qadri. Awami National Party (ANP) leaders however, are silent now, though they were critical against Dr Qadri initially. No leader of ANP was available for comments. The political party which is worst hit by Dr Qadri’s march perhaps is the PML-N. Though the likes of Rana Sanaullah and Hanif Abbasi are criticising Dr Qadri, senior party members are concerned and nervous. Maulana Fazlur Rehman, the leader of Jamiat Ulema-e-Islam-Fazl (JUI-F), is also upset because Dr Qadri’s march may upset his vote bank. Can Mr Qadri show us last Ten yrs tax return. Where did he file those return? How much money he made? What assets are under his name his family name? If US president can tell and show us his tax return every yr, Wht is wrong with this Mullah turned politician. He is asked all these question because he is a politician now, no mor religious leader. By the way did he take any loan from his so called foundation? He must have filed tax return of his foundation in Canada. Can he release those tax return? Can the President of Pakistan; Prime Minister of Pakistan and Parliamentarians show their tax returns having lived and looted this country to bankruptcy. They continue an elitist lifestyle without the income to support it. There needs mass hangings of the politicians and army men. who have bled this country dry. So in effect TUQ is at the same level as the president and prime minister? Then by your logic, he should be hanged along with everyone else? I am asking Mr Qadri to show us or release his previous tax returns. Please do not twist my question. Tell me why I should trust him blindly. Those days are g0ne now. My question for tax return will not effect the out come but every body will know him better. I am not a fan of TUQ but his demands are legits. Pakistan has been hijacked by the feudal lords, Bureaucracy, corrupt politicians and military elite which control most of the resources while denying the people their basic rights. When military dictators come to power they break the country or humiliate and attack their own people to appease the West. When corrupt politicians come to power they loot and transfer the country's wealth outside. Time for change has come. The demand for military role in the caretaker government in a country with a track record like we have will only precipitate the situation. That's the main reason I'm suspicious abt this movement. An independent caretaker government without military interference is due to be set up under the current system as well. Why aggravate the common man so close to the elections? Why not bring a change through the electoral system? Shbz_Shrf in Win_Win Position ; TQ Supported by SS underhand, So he succeeded to reach Islmbd. SS Will Beg A Room in New_Set_Up. in fact , SS & Ch Nisar Did Bulldoze The Dream of , N_Shrf & Mrym_Nwaz . TQ gaining , more & more Support from , Pothohar_Zone , This is , Our Foji_Belt . GHQ has V Strong Support here. So , 1st time in history , Pothohari`s [ keyanys ] will Rule. is this the best SHB could have come up with. Tax returns. For his organization, freedom of information will get you the returns of his last 5 years. No chance of a fraud in Canada. He will go to jail if he misuses a penny from it. You just take him at face value only. he says what we want to say, is doing what we wish we had the courage to do and the commitment of what we dont have the guts to do. I do not trust politician or any mullah turned politician. Reason is money and power makes the person corrupt. So the time have changed. Now these people are corrupt unless proven otherwise. So that is way it is important to know their tax return and assets. For example in USA all the congressman and senators and governors and president release their tax return. So every thing is open . Now Mr Qadri comes in suddenly as politician.he should show his assets.Who is funding his campaign ?Nothing is free. CANADA does not believe in REVOLUTION but in ground root Democracy. Corruption, Purjery, Mis use of power etc are unknown but Crimes henious than murder. Dr. Qadri understands his target. People of Pakistan must follow him. way to go Qadri sahib! What the "dumb" but "brave" Khan shd have done a year back, Qadri is filling that vaccum now!! He has power of khahkis boys on his back so who will bother about thes poltical and e- groups for his coverage.He is popularized in Punjab via hoardings, funny ads behind rickshaws, newspapers and some tv channels.Here only thing matter is how much money is being flooded to raise the dwarf status of this religious cartoon which animation is made by ISI brains as they are all time expert of creating such bogeymen for their handmade rivals and friends too.